Top 10 Things To Do This Summer in Downtown Appleton, One Great Place! Posted on May 12, 2015 by Appleton Downtown Inc.
1. 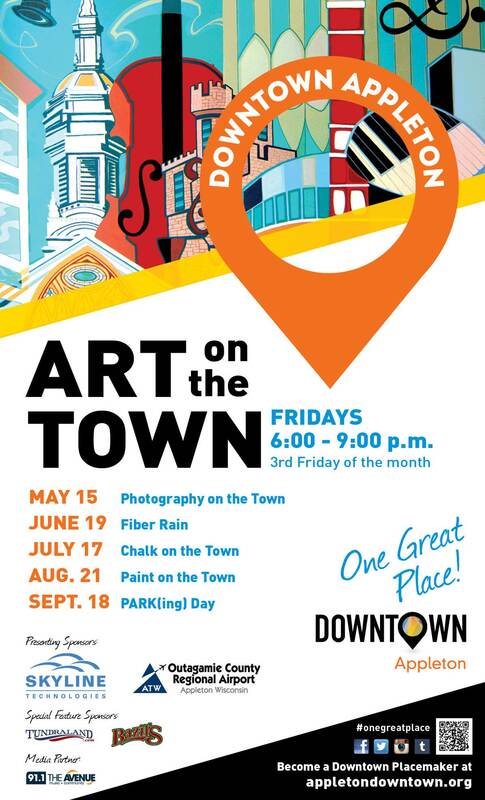 “Be a Part of The Art” at Art On The Town on the third Friday of each month, May-Sept. With 22 venues featuring a variety of artists and a different theme each month, you’ll be delighted! 2. 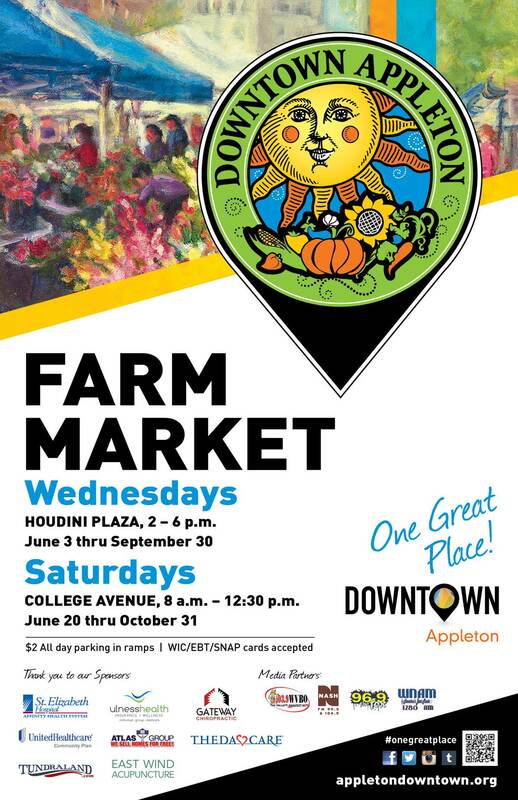 Try the new Mid Week Farm Market in Houdini Plaza every Wednesday, 2-6pm starting June 3. This smaller version offers a great variety on a more walkable scale and offers an alternative for when you’ve run out of your fresh bounty from the past weekend or when you’ll be out of town for the weekend! 3. 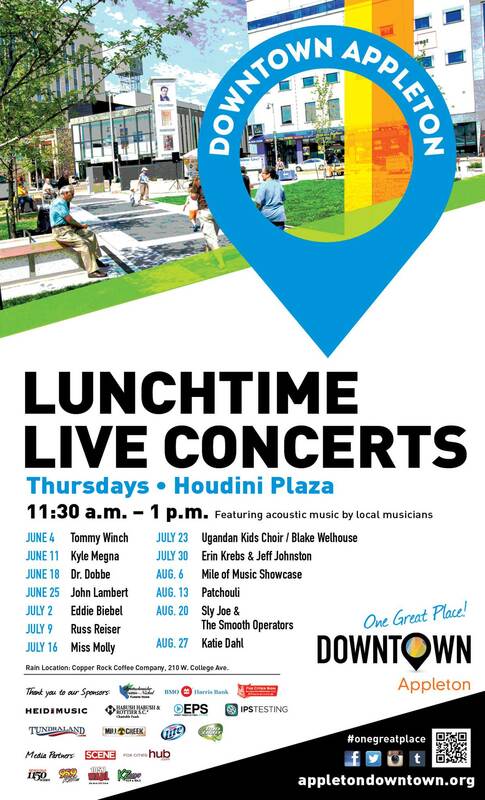 Schedule a weekly lunch in Houdini Plaza every Thursday from 11:30am-1pm starting June 4 so you can enjoy our Lunchtime Live Concerts. Meet with colleagues, friends or just recharge yourself! 4. 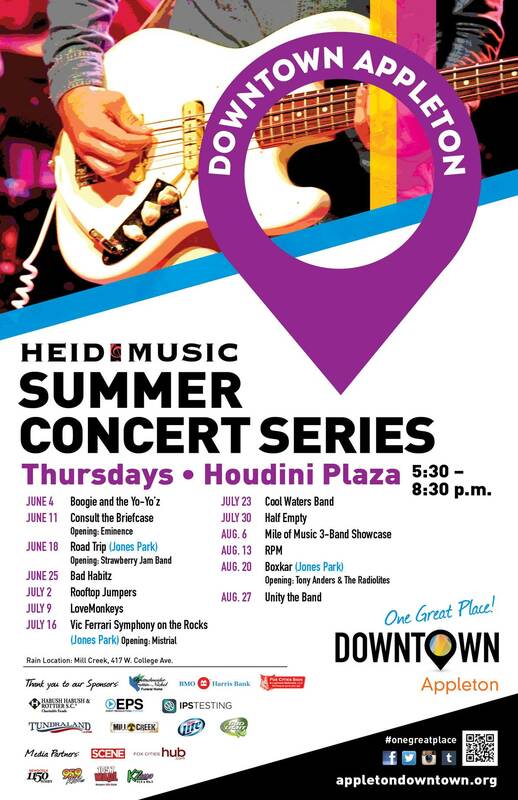 Keep the music buzz going on Thursday's with the Heid Music Summer Concerts from 5:30-8:30pm. With an awesome lineup starting June 4 and continuing all summer, you’re sure to hear your favorites! 5. Enjoy music all week long June 8-12 during Street Music Week over the lunch hour in front of businesses on College Avenue. Leave a tip to benefit Feeding America and let the musicians know you appreciate them! 6. Show your patriotic pride at the nation’s oldest Flag Day Parade on June 13 stepping off from Wisconsin Ave. & State St. at 2pm, continuing Downtown and ending at City Park. 7. Don’t miss the Downtown Appleton Farm Market every Saturday 8am-12:30pm starting June 20. Get fresh ready to eat food, stock your cupboards & refrigerator for the week plus enjoy the entertainment, arts & crafts and more. 8. For those with children, the Children’s Parade on July 22 provides an opportunity to march in a parade. For those without kids, this parade is a great opportunity to be a front row spectator! 9. Invite all your family, friends and neighbors to the 3rd Annual Mile of Music event August 6-9th. This handcrafted artisan festival of original music celebrates Americana. 10. Take a ride on the Downtown Appleton Trolley operating every weekend June through September! It’s free, but donations are appreciated!